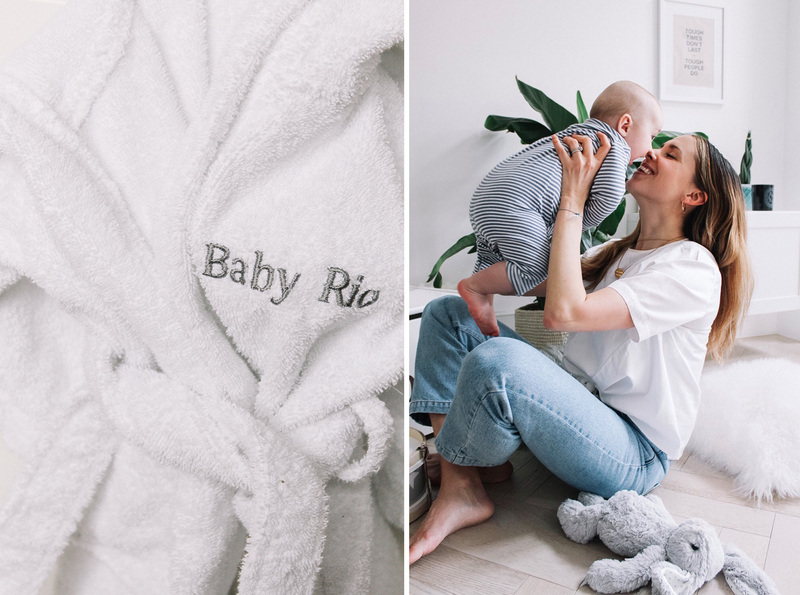 I first came across the brand shortly after Rio was born, when we were literally showered with personalised bathrobes and bath towels (7 in total!). 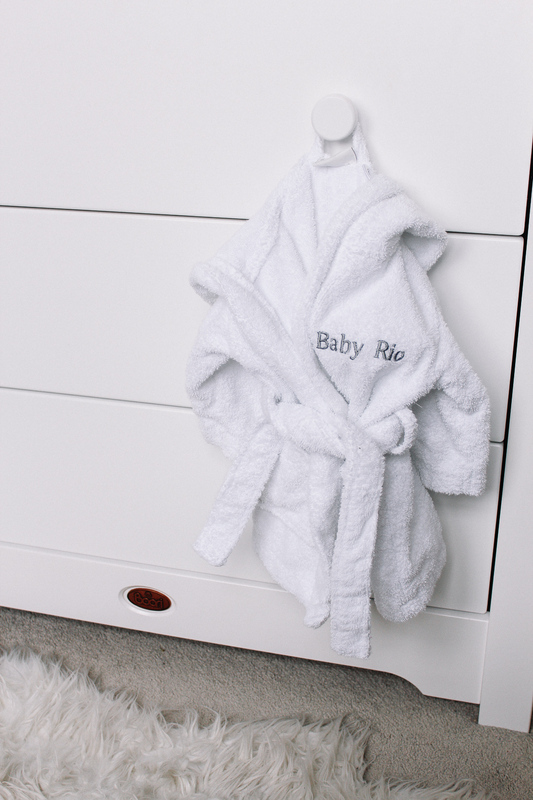 Fortunately, you can’t really have too many towels for a baby, so having that many has actually been super handy – and not to mention, a great gift idea! 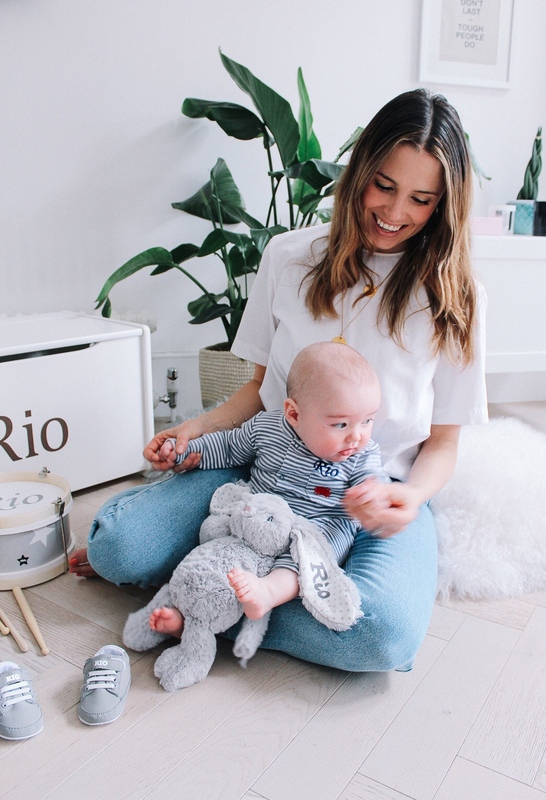 We have a few different variations, with Baby Rio, Rio and Rio Ezra – and he just loves wearing them after bath time. 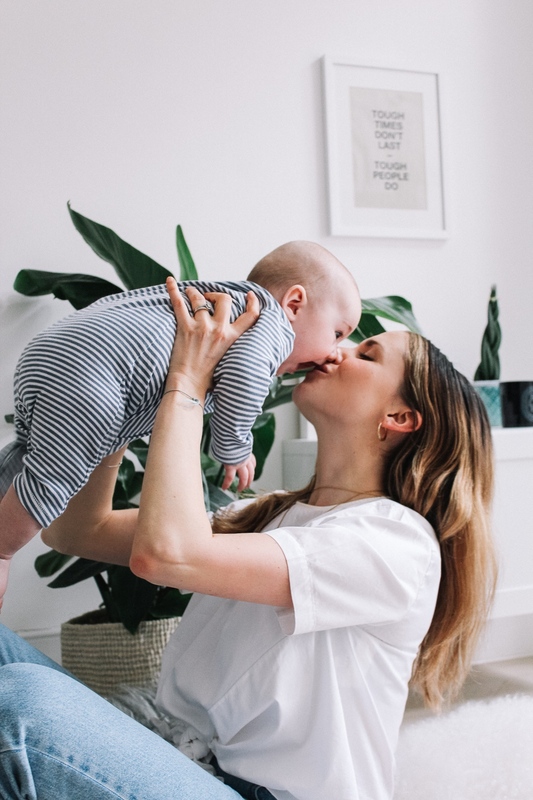 Personalised toys are also great – especially for when they get a bit older. 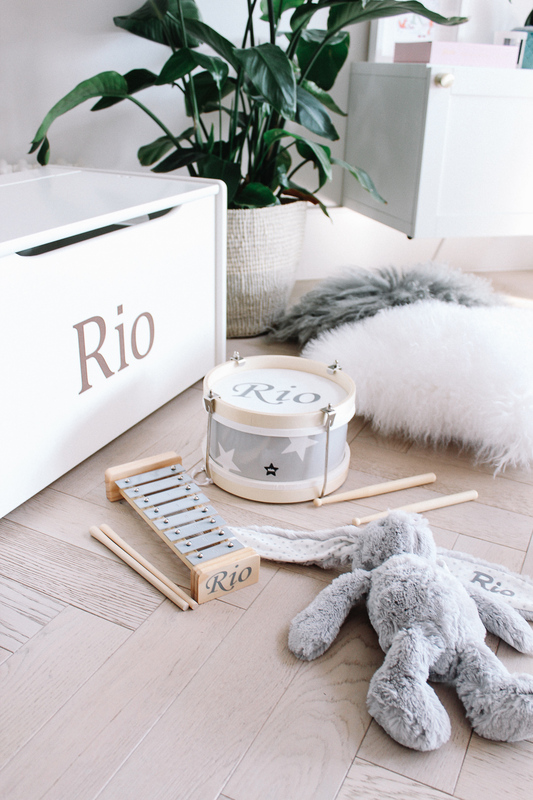 As Sam is really musical and great on the drums – I couldn’t resist getting this Grey Wooden Play Drum for Rio! 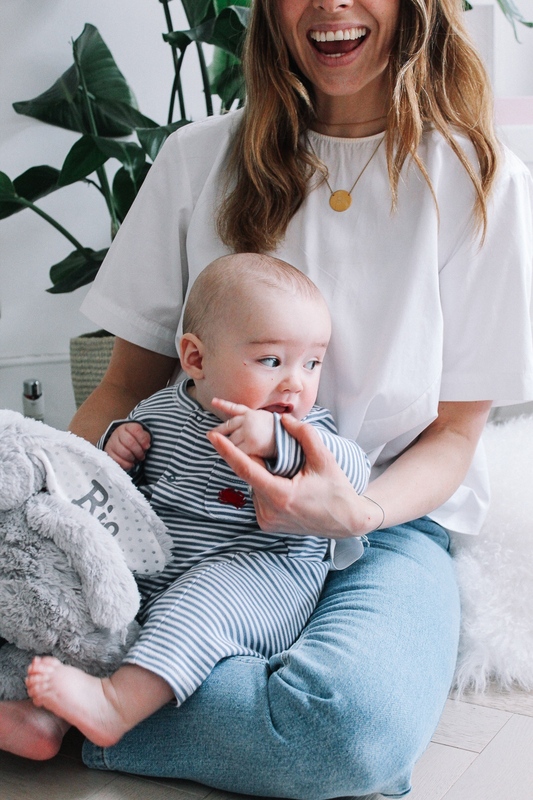 He’s obviously a bit too young for it now, but I’ve got a feeling it’s going to be a (noisy!) favourite of his when he gets that bit older. I also added the Grey Wooden Play Xylophone to the musical mix, which – at the rate he’s developing – I’m sure he’ll start tinkering with in only a few months. 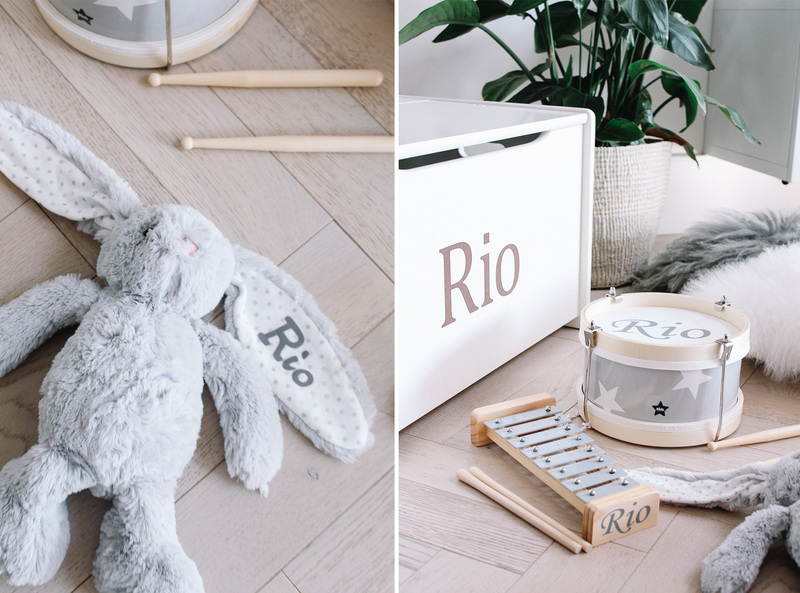 You can also personalise soft toys (Rio loves his ultra cuddly Grey Bunny), as well as cosy blankets, clothes and trainers on the site. A few months ago, I picked up these super cute Grey Velcro Trainers, which are so neutral and easy to pop on and off. 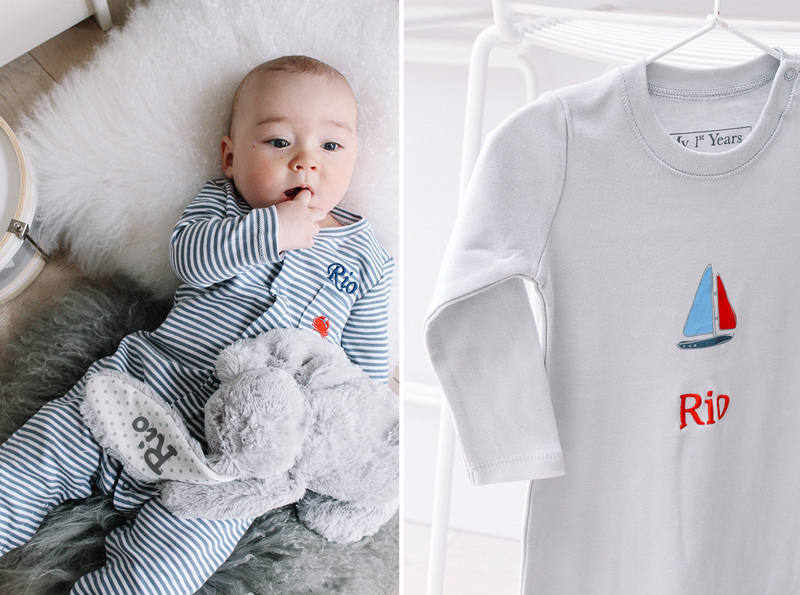 Over the Christmas period, I got him some great festive sleepsuits and vests – and now with Spring (hopefully) just around the corner, I’ve got some new nautical themed sleepsuits. 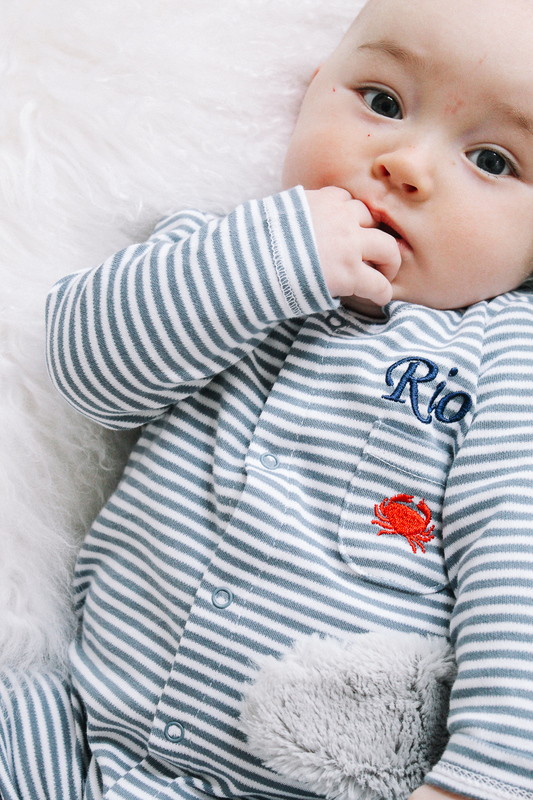 I really love this classic Crab Motif Sleepsuit, which is definitely coming with us on holiday to Dubai in a few days. 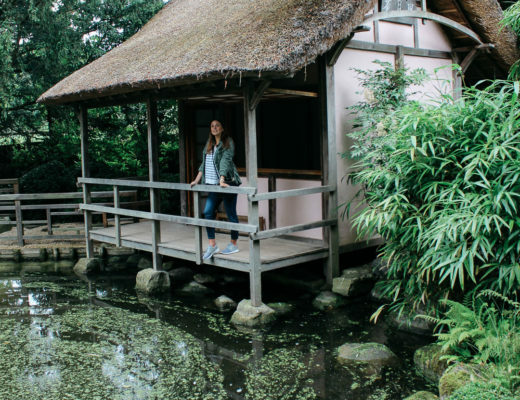 I love the super soft cotton which is really breathable, the easy popper fastenings, and the fact that it’s open at the feet (ideal for warm nights). 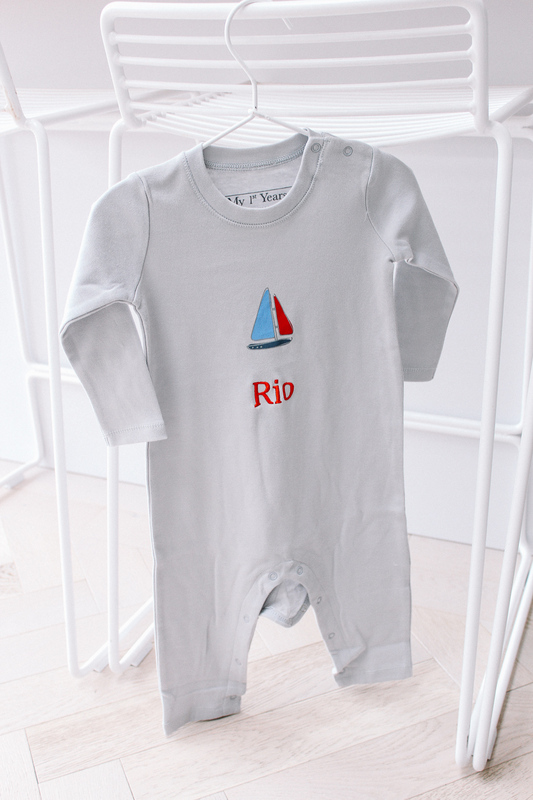 I also got this Sail Boat Motif Sleepsuit – which again is in the softest brushed cotton, and I adore the neutral and classic colour combination. Last but not least – my all-time favourite: the ultimate Toy Chest. It’s definitely more of an investment, but in my opinion, it’s probably the nicest toy chest I have come across. 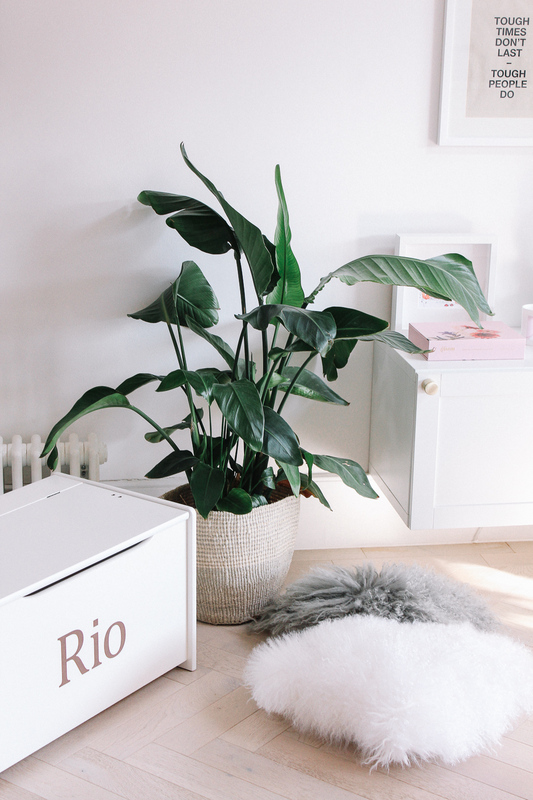 Firstly, it’s a real classic and timeless piece of furniture – which will look good in any type of home (even if it has to be on show in your kitchen or lounge). 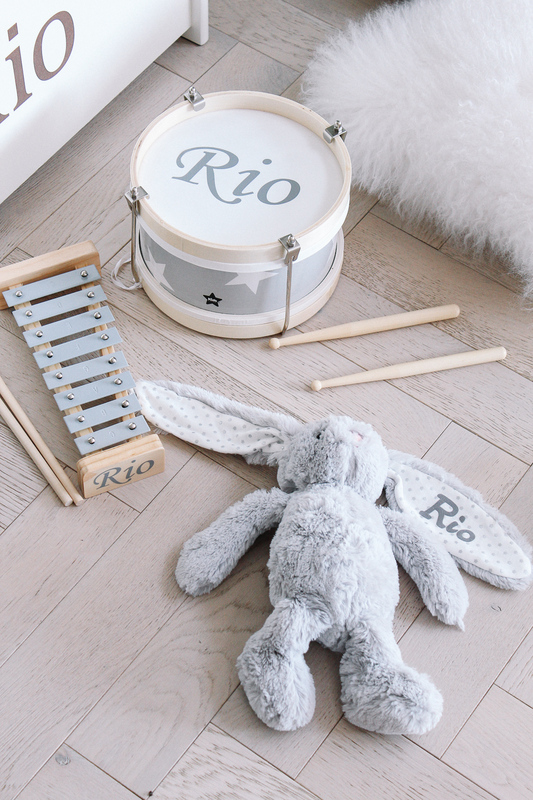 Made from white wood, it’s a real neutral style, and I’ve been really impressed by the overall quality. 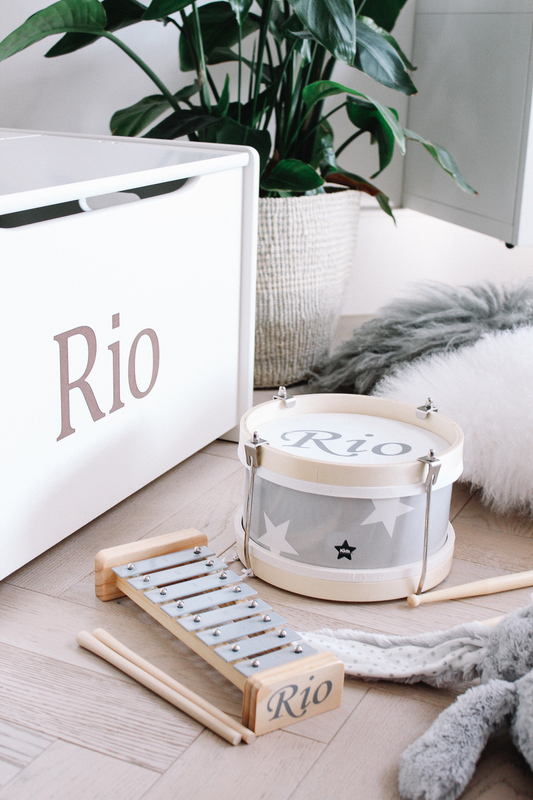 With a ‘soft close’ mechanism to keep those little fingers safe – it also has ample storage and space to keep all that colourful clutter away! Created in collaboration with My 1st Years. 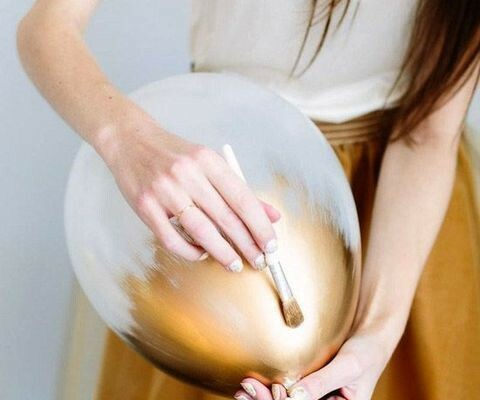 All words, opinions, styling & creative direction are, as always, my own.